Oil-Core Skillet by American Royalty 10"
Categories/ Cookware*/Oil-Core Skillet by American Royalty 10"
This beautiful 18/10 Stainless Steel Skillet has an internal high viscocity liquid (oil) that heats the entire skillet across the bottom and up the sides of the pan. 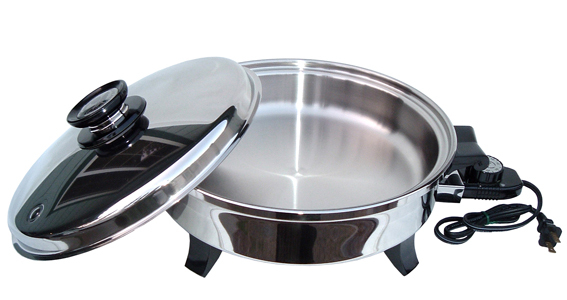 This allows us to evenly cook anything and and hold it at the temperature we want for any time period. I use it to keep my chocolate at the right temperature for dipping, but you can see there are many other uses. heat evenly over the entire cooking surface. hot even after the skillet is unplugged. Multi-purpose skillet is great for roasting, sautéing, pan broiling and baking. Liquid oil core spreads heat evenly over the entire pan cooking surface and up the sides. Retains heat to keep foods warm and looks great on the table. Completely immersible and dishwasher-safe when the heat control is removed. Pleasurable dining any time of day - elegant dinners, hearty breakfast, quick lunches and nutritious snacks. Create all this and more with the "oil core" cooking concept.